It’s been said that it takes just one magnificent building to launch an architect’s career. For David M. Harper, president and CEO of Miami’s top-rated architectural firm HADP Architecture, it was his very first: the library at FIU’s Modesto A. Maidique Campus that he designed while with the firm of Ferendino/Grafton/Spillis/Candela. 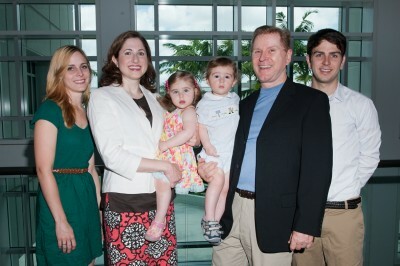 The Harper family (from left to right): Laura, Jennifer, Elizabeth, Benjamin, David and Michael. This summer, Harper returned to his roots, visiting the Steven and Dorothea Green Library with his family. They marveled at the non-stop “traffic” at one of the most popular spots at a university serving 48,000 students. Ranked among the largest library structures in the nation, the Green Library is the iconic building of FIU’s Modesto A. Maidique Campus. Its seventh and eighth floors boast floor-to-ceiling windows with panoramic views of the growing campus and Miami skyline. 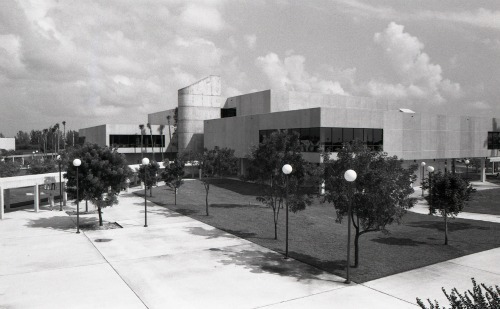 The original FIU Library, designed by David M. Harper while with the firm of Ferendino/Grafton/Spillis/Candela. Harper’s original design from the 1970s was three stories. The library underwent an expansion in the late 1990s designed by another local architect, M.C. Harry and Associates with James Piersol as the principal architect. M.C. Harry and Associates was just named the Florida AIA Firm of the year. That expansion is still considered extraordinary because an eight-floor structure was built around the original building – while it was still in use. The 1998 renovation by M.C. Harry and Associates included deep footers that will allow for a second, future expansion with additional floors. To celebrate its completion, Harper made a six-figure gift to FIU Libraries (including state match), which was recognized with the naming of its two-story atrium. Fast forward 39 years. Harper’s firm, HADP Architecture, took the number one slot for architectural firms headquartered in Miami, ranked by 2011 revenue, according to an annual list published by industry leader Architectural Record. HADP boasts signature buildings worldwide, notably the firm’s design of the first phase of the American Airlines Terminal at Miami International Airport, which was the recipient of numerous awards. Harper has not lost the focus of his original inspiration, having managed more than 1,500 school and university projects across the United States, ranging from science laboratories to law schools to performing arts centers. Harper has just begun a new project that is close to his heart and FIU. The Green Energy Home that he is building in Pinecrest for his family, including wife Jennifer and four children, will be the first LEED Gold home in South Florida designed and built from new construction. Producing all of its own energy, it will be a training tool for FIU’s graduate students and faculty members spanning across the disciplines of architecture, engineering and interior design.